We just got back from spending 3 nights in Carlsbad, California to visit Legoland. We wanted to take one last trip as a family of 3 before our daughter joins us next month. Since our son loves to run and explore, we figured Legoland would be a great place for him to visit. We stayed 3 nights for free at the Grand Pacific Palisades hotel, paid for with Chase Ultimate Rewards points. The Grand Pacific Palisades hotel is a 5 minute walk from Legoland (it’s right across the street). We booked our stay here because their rate was cheaper than staying at the Legoland Hotel (which is located just outside the entrance of Legoland). The best part was that we could use our Ultimate Rewards points to cover the cost of our hotel stay! We booked our 3 night stay at the Grand Pacific Palisades hotel through the Chase travel portal with 30,687 Ultimate Rewards points. The Grand Pacific Palisades has some really nice amenities for adults and children. For adults, there is a heated pool and jacuzzi that opens until midnight. There is also a small gym with some machines, free weights and treadmills where I worked out at night. For children, there is a separate children’s pool that is only 3 to 4 feet deep. The children’s pool is also heated. Just next to the children’s pool is a small water park where kids can splash around. There is also a small children’s play area with a castle and slides. We enjoyed dinner at Karl Strauss brewery restaurant on our first night. This restaurant is located right on the Grand Pacific Palisades property. They also provide in room dining service if you don’t feel like leaving the hotel to go eat. I enjoyed the Big Beer Burger, described as “based with Columbia Street Amber, topped with Red Trolley Ale onions. Tower 10 IPA mushrooms, beer-brined bacon, Wreck Alley Imperial Stout cheddar, tomato, lettuce, and fries. Served with Tower 10 IPA steak sauce.” It was delicious! My wife enjoyed the Fish n Chips, with “battered Alaskan Cod, caper remoulade, and house-made broccoli slaw.” The fish was crispy on the outside, and flaky on the inside. Our son had the kid’s chicken strips meal. We went to visit Legoland on both Friday and Saturday, for two packed days of fun. Legoland opened at 10am, and we were one of the first in line to enter the park on both days. It was great to visit Legoland a week before Thanksgiving, since the park was extremely empty on Friday, and not very crowded on Saturday. There was no wait for every ride that we wanted to go on. And our son could run around the park freely without bumping into anyone. Safari Trek (Explorer Island) – a jeep ride through a jungle filled with Lego animals. Fairy Tail Brook (Explorer Island) – a boat ride through various Lego created fairy tale characters. Legoland Express (Fun Town) – a mini train ride surrounded by Lego animals. Coast Cruise (Miniland) – boat cruise around a lake surrounded by Lego miniature buildings of famous places including the Taj Mahal, Eiffel Tower, Mt. Rushmore, and New York. Our son loved playing with Legos of various sizes at building stations throughout the park. He admired all of the Lego created mini cities and I gawked over the Lego Star Wars sets. He loved playing with the Coast Guard Build A Boat and watching the boats go down the waterslides. He enjoyed running around the Duplo interactive playground and slides at Fun Town. We also got to enjoy a fun little concert with the Lego Friends. Sea Life Aquarium is an attraction packed aquarium located near the entrance of Legoland. Our son already knows the names to many of his favorite sea creatures. 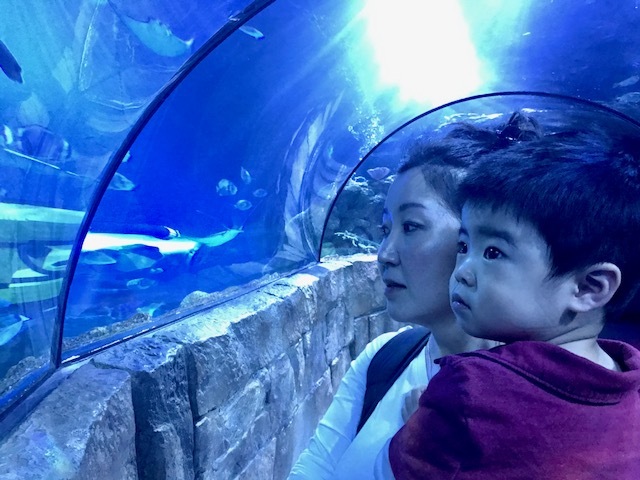 He was so excited to call out all of the creatures he recognized at the aquarium, including sharks, octopi, stingrays, fish, sea stars, crabs, and more. We spent almost 8 hours at Legoland 2 days in a row! We enjoyed lunch at Legoland both days. There are many restaurants here that all looked very tasty. First we had lunch at Urban Kitchen, a market style restaurant where your meal is made in front of you. I had the tasty Philly cheese steak sandwich while my wife and son shared the shrimp spaghetti. The next day we had lunch at Wok n Bowl Ramen, a Japanese style Ramen house. Our son’s current favorite food is noodles so we were glad Legoland offered this food option. We each had the ramen, while our son had the teriyaki chicken stir-fry. Each day our son laid down in his stroller to nap for two hours, giving us the chance to relax over some coffee. We stopped for some delicious Granny’s Apple Fries, which were some type of fried apple coated with cinnamon and topped with vanilla cream. For amusement park restaurants, we found the food to very reasonably priced and pretty good. Legoland admission varies quite a bit, depending on whether you purchase your tickets in advance online or whether you purchase your tickets the day of your visit. The standard price seems to be $95 for adults (13+) and $85 for children over 2 years old for a one day visit to the theme park. Legoland has 2 separate add on park attractions that cost extra on top of your normal ticket price: Sea Life Aquarium (additional $22) and Legoland Water Park (additional $30). There are frequent deals to Legoland throughout the year, which you can find with a quick Google search. Through my work, I was able to get 2 day park hopper tickets to Legoland including Sea Life Aquarium for $140.98 for 2 adults (our 2 year old was free). This gave us 2 full days of Legoland and Sea Life Aquarium for $35.25 each person, each day. While our son wasn’t tall enough to go on many of the Legoland rides, he still had a blast. Since there were no lines, we were able to go on the same rides over and over again. Legoland offers an excellent value for the price, amount of activities to do, and light crowds compared to a place like Disneyland. We had a great time and will definitely come back to Legoland again as a family.